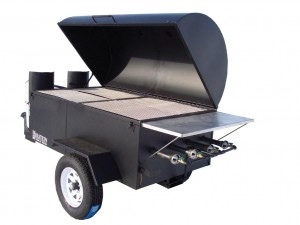 With over 25 model of Towable grills to choose from, we’re sure we have one for you to get the job done. 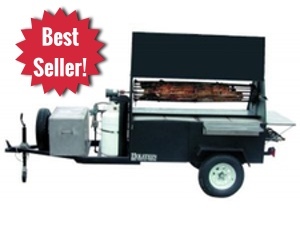 From our smallest Towable Model 4828 to our largest Model 1240 and all the ones in between, our best seller continues to be the Model 7240 and with over 20 options that can be purchased to go on these grills there is very little that can’t be done on them. 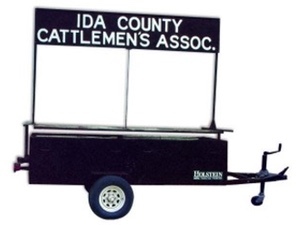 Our grill models are determined by the measurements: 7240 is 72” long by 40”wide. 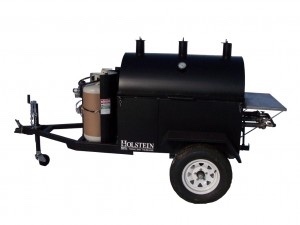 The grills are offered both in Charcoal Models (C) and Gas Models (G) with our gas units being the most popular. 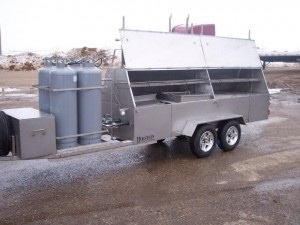 They are built in Black Iron and Stainless Steel, with the Stainless-Steel Models being NSF approved. These grills have the capability for rotisseries, with two different rotisseries to choose from for what your needs maybe. No one stated it better than the late Bill Wall of Billy Bones BBQ, with over 250 barbeque awards and a customer of Holstein Manufacturing for over 30 years. 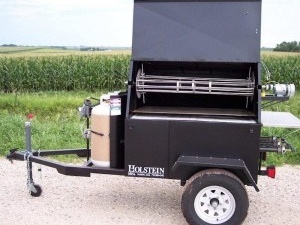 The thing I love about the Holstein grills is the versatility. I cooked pancakes for breakfast with the pancake griddle option, hamburgers and steaks for lunch and rotisserie chicken and smoked ribs for dinner with the Chicken and Rib Rotisserie option. I have also used these grills to serve a five-course meal. I replace a cooking grate with the stainless steel Double Boiler Steam Holding Pan and within 8 minutes I have boiling water to serve clams for an appetizer. Later I use the same water to boil lobster while I cook steaks. Baked potatoes and corn are cooking on the other side. 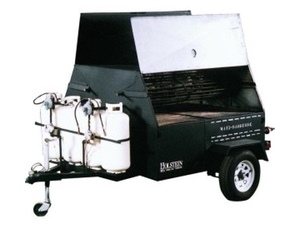 When Holstein Manufacturing added the rear mounted Utility, Stove option my life got even easier. Heating soup and boiling fish and seafood on the stove just magnifies the versatility that was already in place. I have not found a better product. 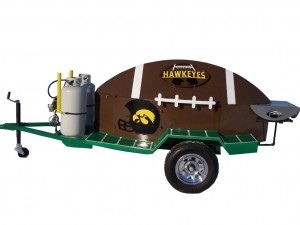 With that said we can supply a grill for a family that likes to tailgate, to the caterer that likes to cook on site, to the Pork and Beef Producer groups that promote their products, to the restaurant that likes that charcoal flavored steak, to the school booster club that needs to cook for their concession stand, and to the church that needs a grill for their fund raiser. The list goes on from there for where these grills can be used. Grates (4) made of 5/16" solid stainless steel rod. 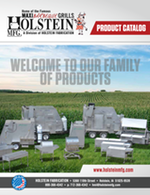 Constructed from heavy 14 gauge steel or 304 food-grade stainless steel.